Thousands of ordinary citizens, politicians and members of the government — as well as friends and family — were present for the last farewell to Greek statesman Konstantinos Mitsotakis, during the funeral service held in Athens on Wednesday afternoon. 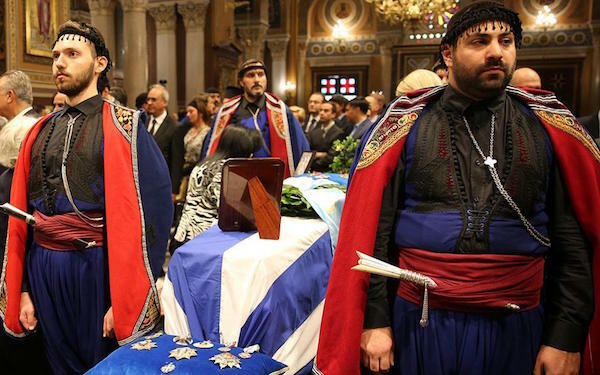 A former prime minister, minister and the honorary leader of the New Democracy party for several decades, Mitsotakis was given a funeral with the honors of a serving prime minister at the Athens Metropolitan Cathedral, where his body had lain in state throughout the morning. First to arrive were members of the family, including his daughter Dora Bakoyannis, an MP, his daughter Alexandra Mitsotakis Gourdain, his daughter Katerina Mitsotaki and his son and main opposition ND leader Kyriakos Mitsotakis, as well as his many grandchildren and great-grandchildren. Among those attending the funeral were President of the Hellenic Republic Prokopis Pavlopoulos, Prime Minister Alexis Tsipras, Cyprus President Nicos Anastasiades and several former Greek premiers, Parliament President Nikos Voutsis and Government Vice-President Yiannis Dragasakis, as well as government ministers, the leaders of Greek political parties, main opposition New Democracy’s Parliamentary group and former ministers and MPs in his cabinet.